Whether you’re a semi-truck driver or managing a fleet of trucks, minimizing your fuel costs can save you a ton of money. Gasoline and diesel costs add up quickly in an industry that relies on pickups, deliveries, and travel time. And since semi-trucks are so heavy, their fuel efficiency isn’t great to begin with. Semi-trucks only get about 6.5 miles per gallon on average. Here are a few tips that can save you at the pump. Your fuel tank can expand and overflow when it’s filled to capacity and the fuel is heated. Heat from the sun or engine can gain the tank and cause overflow when fuel returns to the tank. Overflow isn’t just wasteful, but dangerous to other drivers on the road. More fuel also adds weight, which will slow down your vehicle. 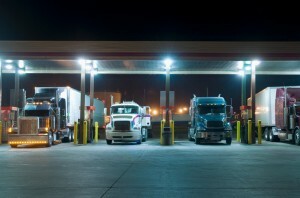 Your truck requires more fuel to speed back up after coming to a complete stop. Although you should follow the laws of the road, smart braking techniques will ensure that you minimize unnecessary stops and save on fuel. You also don’t want to be leaving your truck running idle when you’re at a stop. If you’re going to be away from your truck for more than five minutes then it’s time to take the keys out. Many drivers overlook the need to regularly inflate their tires. Correctly inflated tires, however, will improve your vehicle’s fuel efficiency. For every 1 psi drop in tire pressure, you can lose as much as .3% on your gas mileage. Talk about inefficient! Furthermore, properly inflated tires are safer and have a longer lifespan on the road. Semi-trucks are heavy and build a ton of momentum on their own. Driving at a consistent speed builds momentum, and you can take advantage of that when you’re going up and down hills. Build energy as you go up the hill and ride your momentum without using the gas pedal on your way down. Start slowing down well before you approach a stop or exit. This entry was posted on Friday, August 5th, 2016 at 5:24 pm	and is filed under Fuel. You can follow any responses to this entry through the RSS 2.0 feed. Both comments and pings are currently closed.